Bitterns are short-tailed and short-necked wading birds that have a global presence with subspecies occurring in Europe, Africa, Australia, Asia and Americas. They are usually found in reef beds and similar marshy / wetland areas. They fly with their necks retracted. They mostly feed on amphibians, reptiles, insects and fish. Cinnamon Bittern, Ixobrychus cinnamomeus - Found in tropical Asia from India and Sri Lanka east to China and Indonesia. Mostly resident - although may migrate short distances. Stripe-backed Bittern, Ixobrychus involucris :- Found in Argentina, Bolivia, Brazil, Chile, Colombia, French Guiana, Guyana, Paraguay, Peru, Suriname, Trinidad and Tobago, Uruguay, Venezuela and possibly Ecuador. 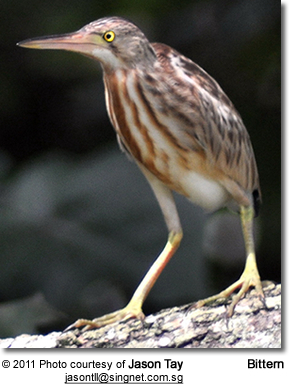 Least Bittern, Ixobrychus exilis - Found in North America - Occur naturally in North America. They breed in the northern parts of their range and migrate to the southernmost coasts of the United States and further south for the winter. 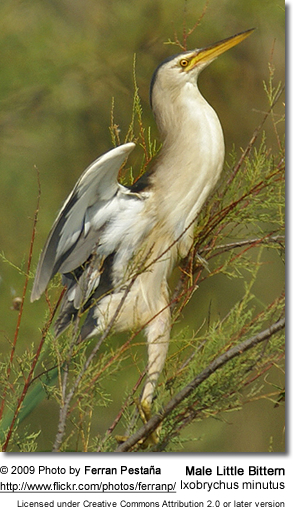 Yellow Bittern, Ixobrychus sinensis - Found in tropical Asia from India and Sri Lanka east to Japan and Indonesia. Mostly resident, but northern birds may migrate short distances. Schrenck's Bittern, Ixobrychus eurhythmus - Breed in China and Siberia from March to July and Japan, migrate to Indonesia, Philippines, Singapore, Laos for the winter, passing through the rest of South-east Asia. 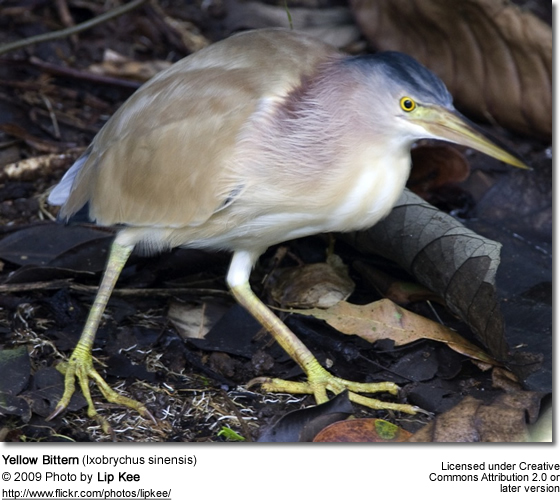 Dwarf Bittern, Ixobrychus sturmii : Found in Africa, specifically Angola, Benin, Botswana, Burkina Faso, Burundi, Cameroon, Central African Republic, Chad, Republic of the Congo, Democratic Republic of the Congo, Ivory Coast, Equatorial Guinea, Ethiopia, Gabon, Gambia, Ghana, Guinea, Kenya, Liberia, Malawi, Mali, Mauritania, Mozambique, Namibia, Niger, Nigeria, Rwanda, Senegal, Sierra Leone, Somalia, South Africa, Spain, Sudan, Swaziland, Tanzania, Togo, Uganda, Zambia and Zimbabwe. American Bittern, Botaurus lentiginosa - Breed in Canada and much of the United States. Move south for the winter in the southern United States and Central America. A very rare vagrant in Europe, including Great Britain and Ireland. Great Bittern or European Bittern, Botaurus stellaris - Found in temperate Europe and Asia. Resident in the milder west and south. Migrates south from colder reasons, when the water freezes. Botaurus pinnatus caribaeus – Eastern Mexico, Belize and (rarely) GuatemalaBotaurus pinnatus pinnatus – Southeastern Nicaragua to Ecuador and the Guianas, south through Brazil to Paraguay and northeastern Argentina. 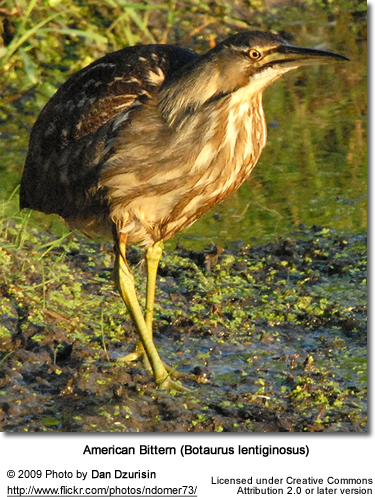 Australasian Bittern, Botaurus poiciloptilus - Found in south-western and south-eastern Australia, Tasmania, New Zealand, New Caledonia and Ouvea. Zigzag Heron (or properly Zigzag Bittern), Zebrilus undulatus - Found in found in South America, specifically: Bolivia, Brazil, Colombia, Ecuador, French Guiana, Guyana, Peru, Suriname and Venezuela.